Organizations are always looking for ways to cut costs and improve their bottom line. Learning and development is one of the departments taking a large chunk of the resources and therefore under constant pressure to find more cost effective ways. On top of this the department is challenged to on-board millennials replacing retiring baby boomers and move their knowledge around much faster than ever before. So is there a way to reduce corporate training costs and boost the flow of knowledge within your organization? Can we empower our employees to take control of their own learning thereby building an efficient, effective framework where less is more? Lean is a systematic approach developed by Toyota and is well known in manufacturing and software development to identify and eliminate anything that doesn’t directly add value. If we apply this approach to training and learning than we have to define what waste is from a Lean perspective. According to some articles and people I have spoken to we might estimate that 70 to 90 percent of today’s learning and development activities could be considered wasteful. 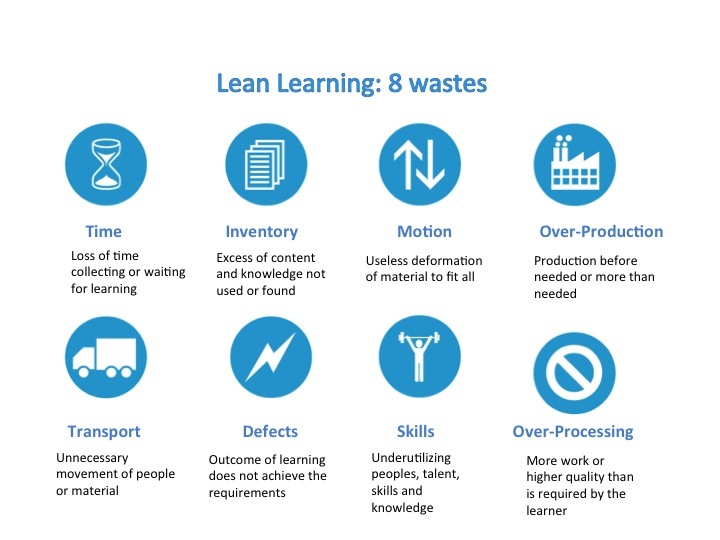 Lean provides a framework by grouping waste into 8 categories – some literature refers to 7 wastes, I prefer to separate inventory from unused skills. Applying this on learning we thereby focus on activities that bring immediate value to the learner. Over-Production: Over-teaching is maybe one of the most common waste situations we see in linear training or onboarding models. All learners, independently from their background need to go to the same curriculum in order to be certified, teaching many of them more than they need to know to fulfill their tasks. Offering content when learners need it would increase learning outcomes as people do not retain content that is not immediately relevant and applicable to them and their jobs. Over-processing: Extra steps and non-essential learning activities are redundant and have a huge impact on time and overall costs. Printing powerpoint slides or making complex slides hardly contribute to the overall learning effectiveness. According to some even pre- and after assessment are extra steps that do not contribute when they do not measure effective learning resulting in changed behavior or increased performance. Time: The time waiting between needing to know something and actually getting the knowledge is not only waste, moreover it can be harmful for the organization. If an employee needs learning to fulfill his tasks he will search for it or assumes to master the task. Searching knowledge in a non-controlled way and assumptions create opportunity for mistakes, errors and negative impact on customers and costs. Inventory: Many organizations hardly use 20% of the learning stock they have. Those stocks of knowledge don’t contribute to learning and moreover they make it hard for learners to find relevant information. Inventory waste is closely linked to Time waste and common examples are corporate learning management systems. Skills: Organizations underestimate their unused talent due to lack of sharing and engaging with others. When performance is not measured on sharing of information talent sometimes stays hidden on the organization. Transportation: Moving people and/or material to a location instead of using other learning options is not only a huge cost but also a waste of time. Defects: Effectiveness of learning content is difficult to measure, required outcomes can be for example performance increase, change of behavior or customer satisfaction. If requirements are not set appropriate, defects will be hard to detect. Motion: Training materials “tailored” for a specific group often are a poor copy of the original and do not answer specific learning needs for a learner. Instead of saving money by re-using content we loose our most important goal namely bringing value to the learner with appropriate individual learning content. By eliminating training waste, Lean frees up time, money and resources that can be used to create and deliver learning that will help drive the organization to new levels of creativity, productivity and performance. Social Learning result in people becoming more informed, gaining a wider perspective, and being able to make better decisions by engaging with others. It acknowledges that learning happens with and through other people connecting them with relevant content, learning assets, and expert information. Lean knowledge transfer and the use of social learning platforms pushes learning professionals and organizations outside their comfort zones by challenging old ways of thinking and delivering training. The combination of user generated content, accessibility, empowerment and community stimulate lean learning not just by acquiring knowledge. Learning and Development responsibles shouldn’t be focused on teaching everyone; they should be concerned with teaching the fewest number of people and making sure the knowledge flows in the organization. 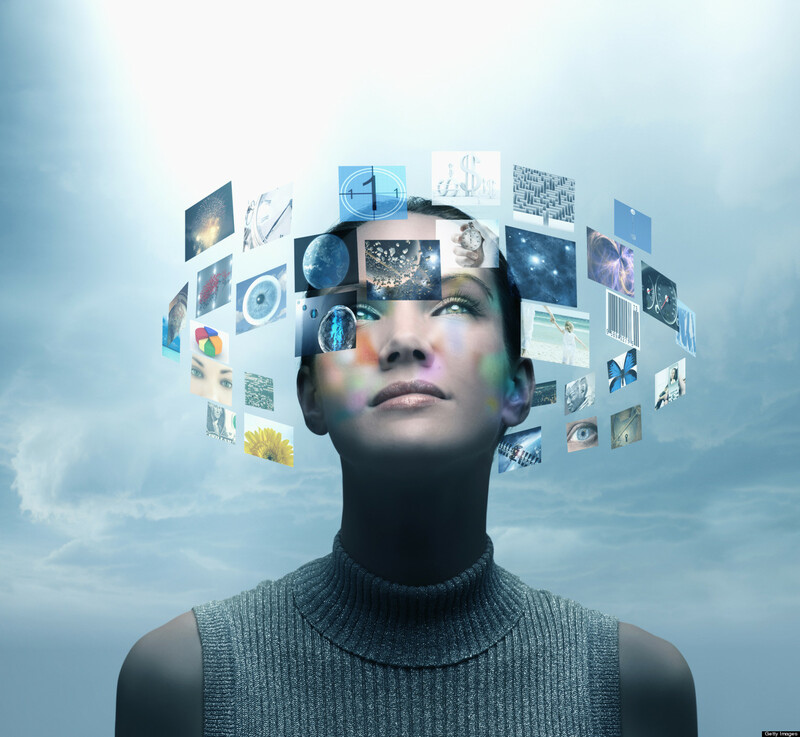 Relevant information should be made accessible as quickly as possible. Applying Lean amplified with social learning tools and platforms will empower your people to come up with learner generated content and new ideas hereby creating a sharing and learning culture and maximizing the return on learning investments. Previous Previous post: When do “Enterprise Social Networks” create value for an organization?